Perhaps this recipe is more forgiving, or perhaps I’ve learnt a lot in the many years since I last tried them, but they were actually really easy. The first thing you’re going to want to do is make yourself (or buy yourself if you’re not as stingy as me) a template. I used a sheet of acetate (one of my favourite kitchen tools) and cut three 11cm circles out of it. How large your circles are will depend on how large you want the tacos to be. Try to envision them folded over and go from there. Then it’s as simple as dolloping a little mixture into the middle of them and using a palette knife (or butter knife if you don’t have one) to smooth it out. When you remove the template you’ll be left with perfectly even circles. To shape them, I suspended a bunch of cannoli forms from my bench. You can use anything you have on hand for this, such as a thick-handled wooden spoor or other utensil. 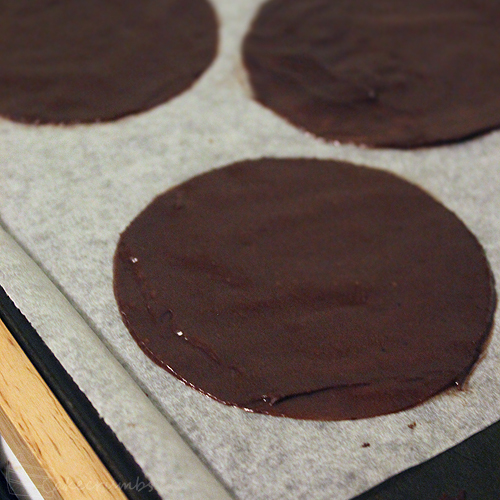 Working quickly, you need to remove the tuiles from the oven and drape them over the form to make a taco shell shape. You have no more than 10 seconds once removed from the oven before they will go hard and cannot be maneuvered. They’re obviously quite hot and you’ll probably burn your fingers a lot. It’s something I’m used to and it doesn’t bother me, but for those of you that are more sane than I am you can avoid it by using something like rubber cleaning gloves to protect your digits. Once they’re completely cool, which is a matter of minutes, they’re ready to be filled. The tuiles will keep for a few days in an air-tight container so they can be made in advance. 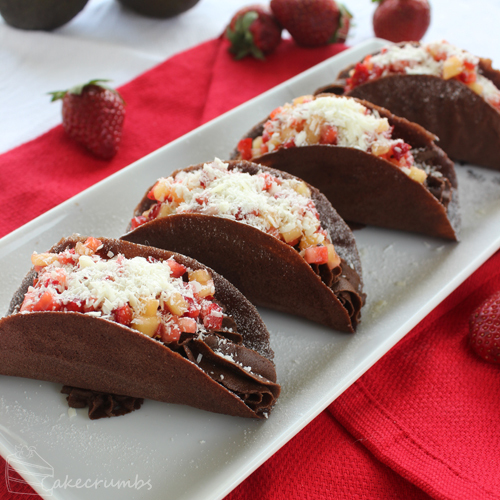 I filled them with chocolate avocado mousse, and topped it with diced strawberries and golden kiwis. In place of cheese I sprinkled some grated white chocolate. The chocolate mousse is really light, fluffy and totally devoid of avocado flavour. You try searching for it on your palate, expecting to taste some kind of savoury, but it’s really hard to pick it. It’s especially difficult without knowing what’s in it. It’s a great dairy-free alternative. It also requires no gelatine to set, making it great for piping. 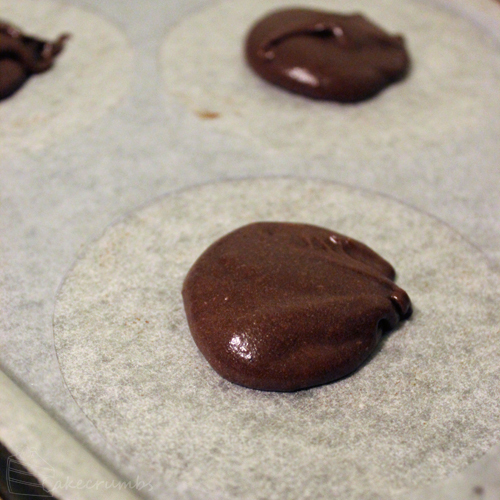 The mousse can be made well in advance and piped into the shells just before serving. Of course you can opt for a less-involved dessert option. The tuiles go great with ice cream and will likely do equally well with most other store-bought creamy desserts. 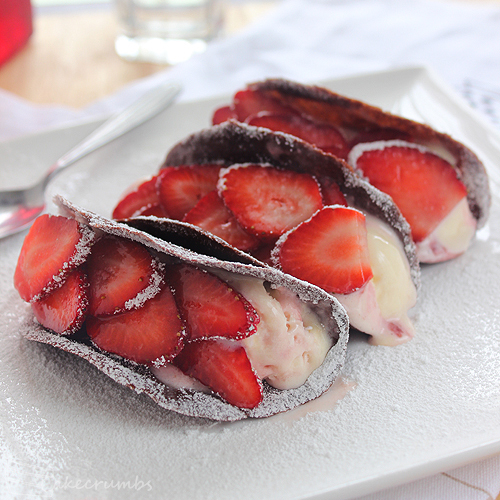 Here I simply served it with some raspberry swirl ice cream and sliced strawberries. Make it as simple or as complicated as you want. The tuiles are so delicious and versatile that they’ll fit most any fillings you come up with. To make the stencil paste, sift the flour and cocoa powder together in a medium bowl. In a separate bowl, whisk the eggs whites and sugar together until smooth. Whisk the flours into the egg mixture; pour in melted butter and vanilla and stir until combined. Preheat oven to 180°C (160°C fan-forced/350°F). Line a baking tray or cookie sheet with grease proof paper. Prepare a circular template. Secure cannoli forms or thick-handled utensil so they overhang the bench (it’s easiest to do this by wedging them under a heavy chopping board or similar). Place your stencil onto the tray and dollop a heaped tablespoon of batter in the centre; use a palate knife or similar to smooth out the paste. Remove the stencil and bake for 8 minutes. Working with the oven door open and the tray still sitting in the oven, remove the tuiles one at a time and drape over the cannoli form to create a taco shape. The tuiles will harden completely in about 10 seconds once removed from the tray so work quickly and only bake a few at a time. Repeat the process until you have used up all the batter. Process avocado in a food processor. If you don’t have one, mash it up with a fork then push it through a sieve to rid any lumps. Place the chocolate with the coconut oil in a bowl set over a saucepan of gently simmering water. Stir until melted and well combined. Combine with avocados. Add the rest of the ingredients to the chocolate mixture and process/mix until smooth and well combined. Refrigerate until ready to use. Pipe the mousse into the tuiles just before serving to avoid moistening the tuiles. 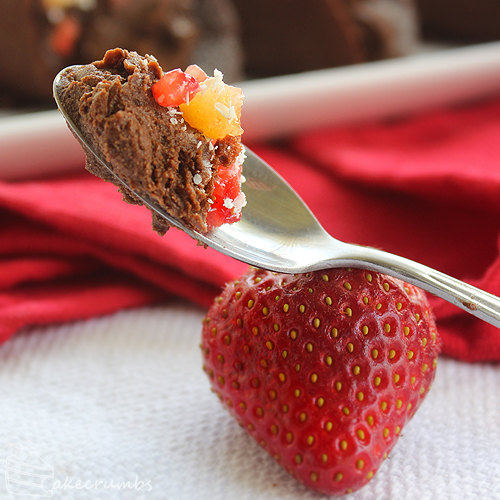 Top with diced fruit and chocolate and serve immediately. 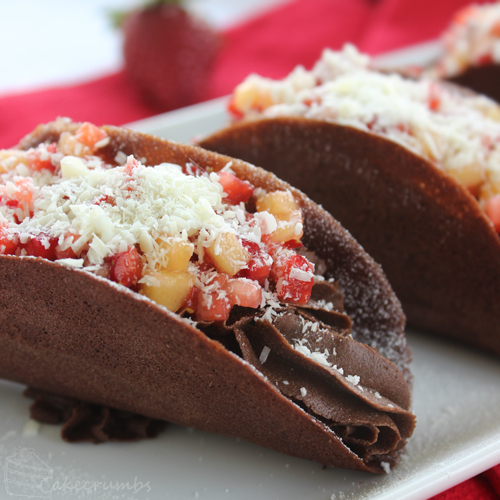 I usually see savoury tacos, first time I’m seeing sweet ones, not to mention chocolatey too! yum! Thanks! I’ve seen sweet ones once in a restaurant but they’re pretty rare. These were very light and refreshing tasting. I loved the replacements of all the typical items on a savoury taco. The photo with the strawberry looks great too. Thank you. 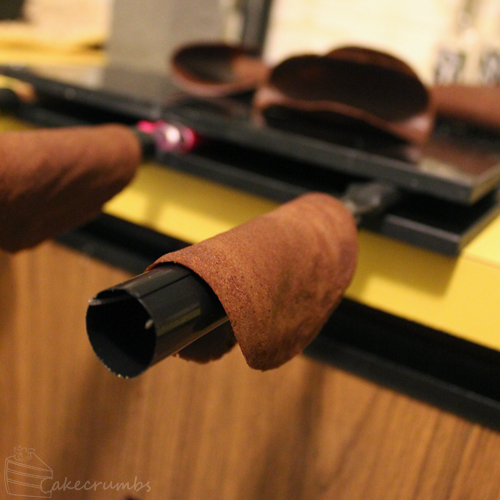 :] Definitely need to spend more time making tuiles now. Such a creative idea, and something that would never have occurred to me! I too have ‘asbestos hands’ as my hubby calls them, from picking up things that are hot – but with a 10sec margin, what else are you going to do?! Haha, exactly! Getting the timing right always takes priority over burning myself. At one stage I was talking to my partner while getting the tuiles out of the oven – I was forming one and it slipped and fell. By instinct I caught it and oh it burned, but saving the tuile was so much more important! Oh my word, those look good!! I am always up for chocolate anything. Will have to try these!! Thank you! 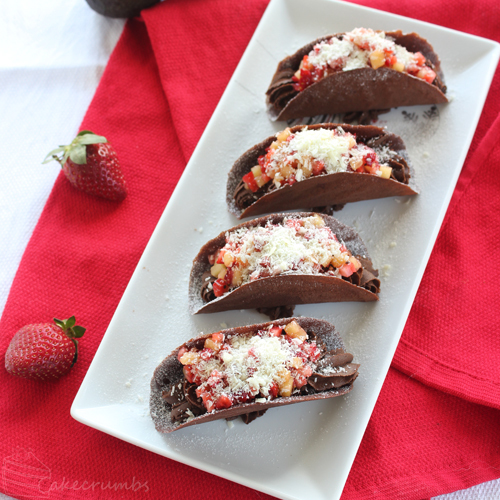 I’m with you – adding chocolate always improves any dish! This recipe is amazing! Made for a get together at a friends house and everyone loved them. I did a little trick in shapeing the shells. I cut the paper into squares before baking my tacos so when I took the shells out of the oven I could use the paper as a help in the shaping process. After the shells had cooled I simply pulled the paper of. I’m often hesitant to state a number a recipe makes as it always depends on how you make it. In this case, how thin and how wide the batter is spread is going to affect the final outcome. From memory this recipe was at least a dozen.